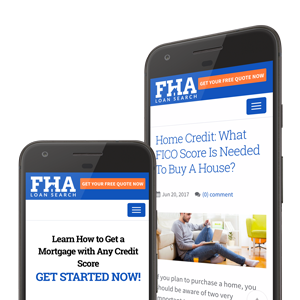 Federal Housing Administration (FHA) provides people from both low and moderate income families an opportunity to purchase a house with easy credit options. They are the most flexible of all mortgage loans that offer housing loans to people with limited budget and impaired credit history. Whatever your situation, it can be helpful to understand how to qualify for an FHA loan in five steps as it is always nice to have more options than not! FHA has determined criteria to assist borrowers get the money they qualify for and help lenders reduce their risk of lending money. There are certain conditions to qualify for FHA loan. You need to show two years of steady employment with the same or increasing income. You should have a minimum credit score of 620 with a history of less than 230 days late payment in the last two years. Bankruptcy and foreclosure must be at least two years old with a perfect credit score after that. Your mortgage payment should be approximately 30 percent of your gross income. These conditions are not too strict. If you don’t meet all the requirements, you can still get your loan approved if there is an appropriate reason for your situation. Every loan necessitates a down payment. Down payment in FHA is relatively low which makes it attractive to many buyers. With an FHA mortgage, you can pay as little as 3.5 percent of the house’s total cost. For example, if you qualify for a $500,000 mortgage, you have to pay $17,500 as down payment. This is in contrast to paying $25,000 if you had applied for a conventional mortgage. You should have enough money saved to make down payment. Without paying this lump-sum money, there is no way you could get a loan. As the down payment is quite low in FHA loan, the risk for lenders is typically high. The lender wants you to have mortgage insurance so that they may have some guarantee of return. The insurance covers the risk of you not meeting your financial obligation. Since your lender is at high risk, he or she may guide you as to where you can find good mortgage insurance. When applying for a mortgage loan, your lender will require you to submit documents that confirm your employment status, income, savings, and credit information. It is a comprehensive look at your financial health stating your payment of taxes, job records and personal information. You should have all the required information collected and related documents compiled from past two years to be submitted before getting a mortgage. Before approving the mortgage, your lender will inspect and analyze the property you are going to buy. Even if you meet all requirements but fail to pass the FHA-approved assessment, your loan may be denied. The inspection team analyzes your property to make sure that it conforms to the health and safety regulations. They also investigate the real worth of your property by comparing it with other houses in the area. You should evaluate different options when getting a mortgage loan. It’s better not to rely solely on your lender for loan suggestions. You should do your own research to know which type of loan suits your requirements. Beginning the pursuit of a home purchase is an exciting endeavor. To empower yourself with the best information to make the best choice, Get Started today and get your free quote to help move you forward. If you’re serious about getting the best interest rate, click on the button to learn more.